For any of those who bought Alan Wake back on the 14th of May (18th in North America) may remember that there was a code for a Game Add-on included in your box, informing you not to discard it, well now's the time to use your code as the first piece of Alan Wake DLC is now available, called "The Signal". The Signal is the newest chapter in Alan Wake's story and not the last with "The Writer" coming out at some point in the future for 560 MS points. Also for any fans who are wanting to get more into the story of Alan Wake don't forget you can pick up the novel written by Rick Burroughs, or even the original score from Sumthing Else Music Works. And if you want to show off your love of the game in your clothing you can pick up some merchandise from the official Alan Wake store or the Alan Wake café press store. 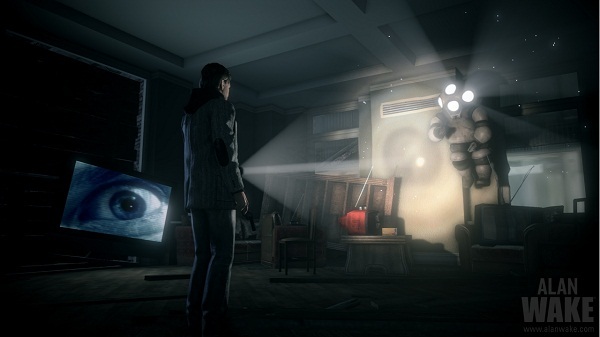 Alan Wake for any crazy Xbox 360 owners that haven't picked it up yet is the newest title from Remedy Entertainment, a psychological action thriller that follows the story of Alan Wake, and his mysterious journey to a little town called Bright Falls. For any of those that didn't purchase a new copy of Alan Wake, The Signal can be bought off the Xbox Live Marketplace for a mere 560 MS points.